A contiguous band of pristine boreal forests extends along the border of Russia and Finland, habitat to northern species like wild reindeer, wolves, and bears. Kostomukshsky Zapovednik was created in Karelia in 1983 to protect a section of virgin forests in this Green Belt. In 1990, the zapovednik was joined with protected areas in Finland to form the Finnish-Russian Nature Reserve Friendship, the first transboundary nature reserve for both countries. Finnish naturalist A.E. Järvinen wrote of the area in the early 20th century "Here the bear, Tsar of the Forest, still treads, and a wolverine peeks out near a root, reaping with his small eyes, shining black as coal, the wild joy and freedom of boundless expanses." Today, wildlife still enjoys boundless virgin forests and the undefiled waters of picturesque Kammenoye Lake in Kostomukshsky Zapovednik. Click on each photo to see a large version. Mushrooms grow on a bed of moss and lichen in a pine forest. A small lake nestles in a tree-lined canyon in the reserve. Wolves, one of 17 predators in the reserve, fight for dominance. Open bogs are one of four types of swamps in the zapovednik. Common cranes nest in the reserve. This chick waits for food from its mother. There are more than 250 lakes in the zapovednik. Poisonous mushrooms spring up near an anthill. The sinuous shores of Kammenoye Lake shelter numerous bays and coves. Leaping over fallen logs in a remote conifer forest of Kostomukshsky Zapovednik, hungry wolves (Canis lupus) trail close behind a small herd of vigorous forest-dwelling reindeer (Rangifer tarandus fennicus), waiting for a young or weak animal to fall behind. Exhausted, the predators stop to rest, unable to keep up with the quick reindeer. Later the pack picks up the fresh trail of a moose (Alces alces) and her two calves. The wolves encircles one calf and move in for the kill, while the mother moose flings her front hooves at the plunderers with enough force to crack a canine skull. Failing to protect one of her offspring, she moves on in effort to save the other. When the wolves have had their fill, they move up to a high ridge with a view over a clearing in the forest to rest. Wolverines (Gulo gulo), having followed the packs movements from a distance, come to collect the scraps. Regrettably, this idyllic scene of predator-prey interaction is becoming less frequent in Kostomukshsky Zapovednik. Reindeer numbers in Karelia have fallen from about 7,000 in the early 1990s to fewer than 4,000 today, and only a handful of reindeer are seen each year in the zapovednik itself. The main reason for this is the barbed wire fence extending along the border between Russia and Finland, which impedes the animals West-East movements. Poaching has also taken a toll on the reindeer population in Karelia. While wolves and reindeer are becoming more rare in the zapovednik, brown bears (Ursus arctos) are still common among large predators. As the snow begins to thaw in April, bears emerge from their deep sleep to roam the frontier forests in search of a meal. Lynx (Felis lynx) occasionally hunt here for mountain hare (Lepus timidus) and rodents. A total of 17 predators out of 40 mammals representative of Siberian, European, and Arctic faunal communities inhabit the virgin boreal forests extending along the Russian-Finnish border. Weighing only two to three grams, the pygmy and minute shrews (Sorex minutus, S. minutissimus) are the smallest mammals in the zapovednik. Beavers (Castor canadensis) and mink (Mustella vison) are found in abundant numbers near bodies of water, and otters (Lutra lutra) are occasionally seen swimming nearby. Over 130 species of birds have been identified in the zapovednik, many of which depend on old growth forests. Of these, 104 are nesting species. Northern boreal species, such as capercaillies (Tetrao urogallus) and black grouse (Lyrurus tetrix) gather in leks during mating season for courtship displays. Five species of woodpeckers chisel away at the trees overhead. The great gray owl (Strix nebulosa) is the largest nocturnal predator in the zapovednik, feeding primarily on voles and lemmings. Waterfowl are abundant in the many lakes and rivers afforded protection in the zapovednik. Black-throated loon (Gavia arctica) is a common nesting species in the reserve, as well as whooping swan (Cygnus cygnus) and bean goose (Anser fabalis). Mallards (Anas platyrhynchos) and teals (A. crecca) nest on islands and shores of lakes in the reserve. Long-tailed duck (Clangula hyemalis) is the most abundant migrating sea-duck here and goldeneye (Bucephala clangula) is common in large and small lakes. In summer, the zapovedniks forests are filled with the songs of passerines: chaffinches (Fringilla coelebs), bramblings (F. montifringilla), rustic buntings (Emberiza rustica), chiffchaffs (Phylloscopus collybita), redstarts (Phoenicurus phoenicurus), and others. The song grows quiet only with the coming of night. In winter, many birds migrate south, leaving only a few species to glide through the snowy forests. Two-barred, parrot, and common crossbills (Loxia leucoptera, L. pityopsittacus, L. curvirostra) and kinglet (Regulus regulus) are common among those that stay behind. Eurasian dipper (Cinclus cinclus) lets out its song over the unfreezing rapids of the Kammenaya River. Rare and endangered birds that nest in the reserve include the golden eagle (Aquila chrysoetus), white-tailed sea eagle (Haliaeetus albibilla), osprey (Pandion haliaetus), and peregrin falcon (Falco peregrinus). One species of reptile  common lizard (Lacerta vivipara), and three amphibians  common toad (Bufo bufo), brown frog (Rana temporaria), and moor frog (R. arvalis), have been found in the reserve. Studies to identify insects, primarily beetles and butterflies, have turned up several rare species. More than 650 species of butterflies and moths (Lepidoptera) have been identified in the zapovednik. More than 340 species of beetles belonging to 46 families of Coleoptera have been found, and the number of beetles that depend on snags and rotting logs is higher here than in many southern forests. Of course, no reserve with forests and bogs could be without bloodsucking insects  there are eight species of mosquitoes (Culicidae), nine species of black flies (Simuliidae), and 16 species of horseflies (Tabanidae) in Kostomukshsky Zapovednik. The rivers and lakes in the zapovednik are spawning grounds for 16 species of fish, including pike (Esox lucius), whitefish (Coregonus lavaretus), grayling (Thymallus thymallus), perch (Perca fluviatilis), cisco (Coregonus albula), and roach (Rutilus rutilus). The freshwater salmon (Salmo salar m. sebago) is found in Kammenoye Lake. Freshwater pearl mussels (Margaritifera margaritifera), which have been collected by local inhabitants for centuries in the region, were discovered in the Kammenaya River in the zapovednik in 1995. The contiguous belt of dense pine and spruce forests, some hundreds of years old, are broken in the reserve only by an occasional meadow, a solemn remnant of an abandoned Karelian settlement. While boreal forests are the dominant floral communities in the zapovednik, many arctic-alpine species grow here at the southern extent of their range. Scotch pine (Pinus sylvestris) forests dominate the reserve, making up 84 percent of the forested area. Norway spruce (Picea abies) forests cover about 16 percent of the zapovednik Birch (Betula pubescens, B. pendula) and aspen (Populus tremula) are found in along river banks and in areas of natural disturbance. From above, the zapovednik looks like a patchwork of dark green spruce forests, light green pine stands, and yellowish-green peat bogs. Many of the forests in the surrounding area have been logged, making the zapovednik one of the few examples of intact forests in Karelia. The coniferous forests are relatively low and the crowns thin and narrow, due to the difficult growing conditions. Marsh tea (Ledum palustre) flowers on the forest floor and bog bilberries (Vaccinium uliginosum) burst with sweet blue nectar. Pine forests with bilberry (Vaccinium myrtillus) and cowberry (V. vitis-idae) undergrowth are the most widespread in the reserve. Their understory consists of ash (Sorbus aucuparia), willow (Salix caprea), gray alder (Alnus incana), and juniper (Juniperus communis). Pine forests with lichens and heather (Calluna vulgaris) on the forest floor are much more limited in distribution, and are found mainly in the lower reaches of the Kammenaya River. Here, lichens from the Cladina genus blanket the ground along with xerophilous shrubs, such as heather, cowberry, and crowberry (Empetrum nigrum). Spruce forests with grassy undergrowth or bilberry grow on the rich soils along streams and at the foot of hills. The increasing frequency of forest fires over the past few centuries due to increased human presence has led to changes in forest composition: forests used to be composed primarily of spruce trees more than 1000 years ago, while pine dominates today. Bogs and swamps cover about 12 percent of the territory. The northwestern and southern parts of the reserve have the most swamps, some which are as large as one square kilometer. Swamps are generally located in narrow depressions of valleys and only in broad flat areas do they form open bogs with sphagnum moss (Spagnum fuscum). Four types of swamps are found in the zapovednik: lowland swamps with spruce forests, raised swamps with dwarf trees, open bogs, and open swamps with rich vegetation. Nearly 400 species of vascular plants have been identified in the zapovednik. Bilberry, cowberry, cranberry (Oxyccos palustris), and cloudberry (R. arcticus) provide bountiful harvests. Four plant species are listed in the Russian Red Book and five other species in the Karelian Red Book. Additionally, there are 124 species of lichens. Alectoria sarmentosa trails from pine and birch trunks and spruce branches like long beards, and is an indicator of clear air and moist microclimatic conditions. Rare species of lichens include Lobaria pulmonaria and Bryoria fremonti. Cladonia amaurocraea and Chrysothrix chlorina grow on rocks along Kammenoye Lake. Two threatened species of mushrooms have been identified in the zapovednik: Leccinum percandidum and Hericium coralloides. The latter grows on rotting trunks of deciduous trees and resembles sea coral. Nearly 50 species of aquatic plants have been recorded in Kammenoye Lake, a large number for a remote lake poor in nutrients. Here, threatened species include Lobelia dortmanna, Isoetes lacustris, and I. setacea. Kostomukshsky Zapovednik is the only reserve in Russia where Isoetes lacustris is found, while the other two species are found only in Kostomukshsky and Kivach zapovedniks in Karelia. The reserve has a large variety of soils, distributed in a mosaic pattern. Weakly developed soils (Leptosols) formed where bedrock is near the surface. Boulder fields and rocky places are numerous. Ferric podzols, humus podzols, and gley podzols are the most common soil types in the reserve. Peat bog soils (Histosols) are found in areas of excessive moisture. Kostomukshshy Zapovednik is located in the northern part of the Karelia Province in the Kostomukshsky District on the border with Finland. The reserve is situated in the Kammenoye Lake watershed. The relief of the northern part of the reserve is mostly flat with some hills. Parallel ridges made up of granite, the highest of which reach 250-300 meters above sea level, transect the central and southern portions of the reserve. Canyons and cliffs covered with ancient forests can be seen in this part of the zapovednik. The water divide between the Baltic and White seas runs through the zapovednik. Lakes cover one-fifth of its territory. Most rivers in the reserve drain into the Kammenaya River, which joins the Chirka-Kem River, then the Kem River to the White Sea. Some lakes and streams in the southern part of the zapovednik flow into Botnia Bay of the Baltic Sea. The Kamennyaya River, which means "stony", aptly describing its upper reaches as it descends through picturesque canyons, cuts the zapovednik almost in two. The river runs over rapids for more than 30 kilometers. A series of lakes are strung along the Kammenaya River like beads on a necklace, starting from Kammenoye Lake, the largest lake in the zapovednik with over 100 sq. km of surface area. Kammenoye Lake, most of which is protected in zapovednik, has numerous large and small islands, dividing it into three parts. The sinuous shores are high and rocky in the northern part of lake, sandy and strewn with boulders in the central part of the lake, and low and swampy with occasional hills in the southern part. The average depth of the lake is 8.6 m, but depths in the northern waters reach 26 m.
Average annual precipitation from 1946-1993 in the zapovednik was 540 mm. Precipitation is distributed for 180-190 days throughout the year. The first snow falls generally in October, forming stable snow cover in November. Strong winds set in for the long, severe winter. Temperatures drop below 5oC for 130 days of the year, rising to above 10oC for only three months. Winter temperatures can plummet to a chilly -40oC. The snow pack reaches 70-80 cm, and sometimes a meter, by the end of winter. The coldest month of the year is January, when the average temperature is -12.6oC. July is the warmest month, when the average temperature is 15.8oC. White nights in summer, when the sun never sets and hovers just above the horizon, extend from the end of May through July, while in winter the sun often doesnt lighten up the snowy landscape for days at a time. Kostomukshy Zapovednik was originally created to protect boreal forest habitat for the forest reindeer and preserve salmon in Kammenoye Lake. The zapovednik carries out long-term environmental monitoring and ecological education activities, and participates in environmental impact assessments of large economic projects in the region. Kostomukshsky Zapovednik was granted a European Diploma, awarded by the Committee of Ministers of the Council of Europe in 1998. Work is now underway to list the Green Belt along the Russian-Finnish border as a UNESCO World Heritage Site. Since 1990, the Kostomukshsky Zapovednik has been part of the Russian-Finnish Nature Reserve Friendship ("Druzhba"). The transboundary reserve is an important forum for cooperation in nature conservation and sustainable nature use between Russia and Finland. On the Finnish side, the Juortanansalon-Lapinsuon Preserve (48 km2), the Iso-Palosen and Maariansärkkien Preserve (39 km2), the Lentuan Preserve (50 km2), the Elimyssalon Preserve (81 km2), and the strictly protected Ulvinsalon Preserve (34 km2) form a network of nature reserves protecting patches of boreal forest habitat. These, together with Kostomukshsky Zapovednik, make up the Russian-Finnish Nature Reserve Friendship, the first international transboundary protected area in both Russia and in Finland. Human activities are forbidden on the territory of Kostomukshsky Zapovednik, with the exception of scientific research and ecological education activities. Several routes for visitors are open in the zapovednik, where hiking, cross-country skiing, and boating are permitted when accompanied by a guide from the reserve. Visits to the zapovednik can be combined with trips to the Friendship Nature Reserve in Finland. Threats to pristine ecosystems in the nature reserve mainly stem from logging on adjacent lands and air pollution from the Kostomukshsky iron ore refinery, completed in 1984. Additionally, barbed wire barricades along the entire Russian-Finnish border impede the movements of wild reindeer, moose, and other animals, disrupting natural patterns and processes. Special thanks to Boris Kashevarov (boris.K@onego.ru), Head of the Scientific Department of the Kostomukshsky Zapovednik, for providing material for this site. Juntunen, K., and O. Isokääntä, eds. Nature of Kainuu and the border region of Belomorskaya Karelia. Forest Service of Finland, Vammalan Kirjapaino Oy Publishers, 2000. Kashevarov B. Comparative Analysis of Biodiversity in the Finnish-Russian Friendship Nature Reserve in Biodiversity conservation in transboundary protected areas in Europe. Ecopoint, Praha, 1996: pp.56-61. Lindholm, T., R. Heikkilä, and M. Heikkilä, eds. 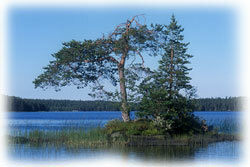 Ecosystems, fauna and flora of the Finnish-Russian Nature Reserve Friendship. Finnish Environment Institute, Oy Edita Ab Publishers, Helsinki, 1997. Sokolov, V.E. and E.E. Syroechkovsky, eds. Zapovedniks of the USSR: Western European Part of Russia I. Mysl publishing agency, Moscow, 1988. Zabelina, N.M, L.S. Isaeva-Petrova, and L.V. Kuleshova. Zapovedniks and National Parks of Russia. Logata. Moscow, 1998. Text prepared by Laura Williams.